Oatmeal with berries and banana after a workout . 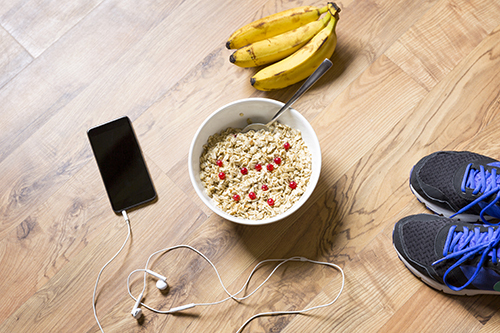 We know you put a lot of effort into your workouts, but have you planned out your post workout meal? Giving your body the right nutrients after a workout is just as important as fueling it. Eating carbs, protein and healthy fats within an hour after a workout helps decrease muscle protein breakdown, increase muscle growth, re-store your energy levels and enhance your recovery! Carbohydrates include pasta, whole grain bread/crackers, oatmeal, pita’s, granola, and corn tortillas. Carbs are used to replenish the glycogen stores in your body- this energy that is stored in your liver to fuel your body. Proteins include meats (chicken, turkey, beef, pork, tuna etc.) , soy butter, eggs, nuts and some leafy vegetables like spinach or kale. You body needs protein to build and repair bones, muscles, cartilage and tissues that can be torn during a workout. Healthy fats can be found in avocados, whole milk cheese, nuts, eggs and dark chocolate! Healthy fats may slow down food absorption but can still be used in muscle growth and building. It has been recommended by the International Society of Sports Nutrition that people should consume 0.14–0.23 grams of protein per pound of body weight (0.3–0.5 grams/kg) very soon after a workout to provide the body with necessary amino acids and to build and repair the tissues and muscles. Stay tuned next Tuesday for our next #TrainWithGrainsTip! Follow #TrainWithGrainsTip and #TrainWithGrainsTuesday on Twitter and Facebook to see more whole grain tips!